This Healthy Eating Blog is where you can find some essential information regarding healthy foods, as well as general health, exercise, recipes and much more. Topics to help fight cancers and heart disease, ways to lower your cholesterol, building muscle, and much more. All put together into easy-reading articles for the readers benefit. What to eat and drink for Breakfast? Eggs do often get a bad reputation, but they contain lots of essential nutrients, 13 in fact, including protein. Research has shown that a high-protein morning meal wards off unhealthy snacking later in the day. I’ve done a short post about coffee and its benefits in the past, and here it is again. This essential morning ‘get-me-up’ is packed with antioxidants. In moderate amounts coffee has shown to have heart benefits and may slow cognitive decline. It may also ward off some cancers, including basal cell carcinoma, the most common cancer in the world, and protect you from type 2 diabetes. Coffee-Break anyone!? 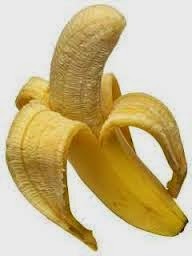 A medium banana is rich in fibre, vitamin C and potassium, which you don't often get in the typical American diet without a heavy dose of salt. A medium banana has 422 milligrams of potassium and no sodium. This combination can help control blood pressure. A great source of vitamin C and potassium. 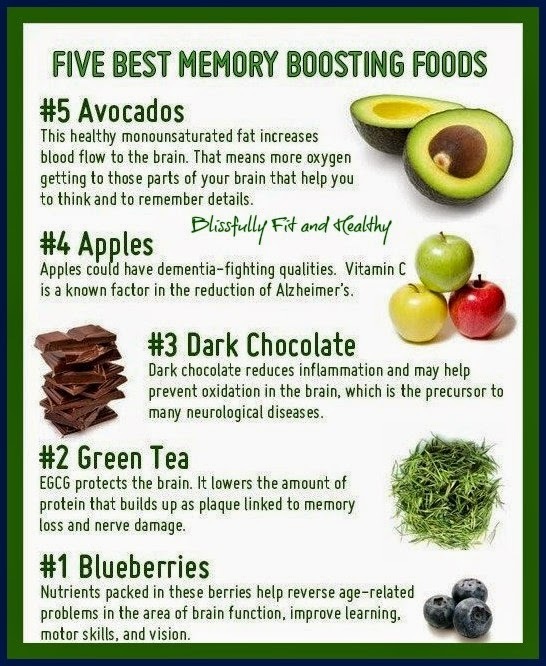 Also high in fibre to help you feel fuller longer. A 2006 study found that making half a grapefruit your "appetizer" of sorts can speed up weight loss. Greek yogurt is a great source of protein. It's also a great source of calcium. Just stay away from the flavoured varieties. It's diluted with added sugars. Instead, opt for low-fat plain and sweeten with fresh fruit. Carbs - Energy, Muscle-Building and Brain Power......PLUS WIN £500 CASH!!! 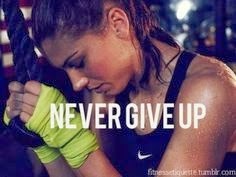 Low blood sugar deprives your brain of glucose, leaving you fluffy-headed and weak. The good news? Mental stimulation is packaged in punnets: scientists have linked carb-rich berries to reduced oxidative damage in the brain, which follows earlier research that a blueberry smoothie maintains concentration for up to five hours. And that's about it for the carb blog post and the benefits they include. But remember, too much can be bad, so make sure you follow the above advice. One last thing before I go, I am doing a competition where you could win £500 cash (paid into your PayPal account). All you have to do is purchase a £1.00 ticket, before 10/08/2014. You can enter as many times as you like, and there are no restrictions on entrants, so please share around. Winner will be picked at random on Friday 15th August 2014 23:00PM BST. Every infant and child has the right to good nutrition according to the Convention on the Rights of the Child. Globally in 2012, 162 million children under 5 were estimated to be stunted and 51 million have low weight-for-height, mostly as a consequence of poor feeding and repeated infections; 44 million were overweight or obese. About 38% of infants 0 to 6 months old are exclusively breastfed. Few children receive nutritionally adequate and safe complementary foods; in many countries only a third of breastfed infants 6–23 months of age meet the criteria of dietary diversity and feeding frequency that are appropriate for their age. About 800 000 children's lives could be saved every year among children under 5, if all children 0–23 months were optimally breastfed. Undernutrition is associated with more than one third of the global disease burden for children under 5. Infant and young child feeding is a key area to improve child survival and promote healthy growth and development. The first 2 years of a child’s life are particularly important, as optimal nutrition during this period lowers morbidity and mortality, reduces the risk of chronic disease, and fosters better development overall. Optimal breastfeeding is so critical that it could save about 800 000 under 5 child lives every year. In countries where stunting is highly prevalent, promotion of breastfeeding and appropriate complementary feeding could prevent about 220 000 deaths among children under 5 years of age. the introduction of nutritionally-adequate and safe complementary (solid) foods at 6 months together with continued breastfeeding up to two years of age or beyond. Breast milk is also an important source of energy and nutrients in children aged 6 to 23 months. It can provide half or more of a child’s energy needs between the ages of 6 and 12 months, and one third of energy needs between 12 and 24 months. Breast milk is also a critical source of energy and nutrients during illness, and reduces mortality among children who are malnourished. Adults who were breastfed as babies are less likely to be overweight/obese. Children and adolescents that have been breastfed perform better in intelligence tests. Breastfeeding also contributes to the health and well-being of mothers; it reduces the risk of ovarian and breast cancer and helps space pregnancies–exclusive breastfeeding of babies under 6 months has a hormonal effect which often induces a lack of menstruation. This is a natural (though not fail-safe) method of birth control known as the Lactation Amenorrhoea Method. Information sourced from the World Health Organisation website. Please check back regularly for more posts and also check the offers posted around the site, loads to choose from. Thanks for reading. Below I've listed a few of the best current health deals on offer today! From weight loss supplements to sexual health supplements. Check the links and see if anything takes your fancy. And especially look out for the deals with free product offers. All are genuine, tested and reviewed products. If you have any questions please contact me. Also, if there's a particular product you're looking for, just ask, I can sort many products, including tooth whitening, joint care, many weight loss products, hair loss or removal, and more. Professional athletes and bodybuilders turn to creatine supplements when they want to get the most out of their workout. They use creatine supplements for their ability to help support building of muscle tissue and increasing energy during workouts. 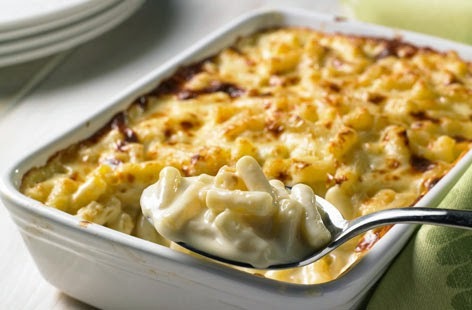 I came across a simple healthy recipe for the classic, macaroni cheese, and today, I'll share it with you. Just 405 calories, only 7 grams of fat and 18 grams of carbohydrates. 1) Put a large pan of water to boil on a medium heat. Add salt to the water. Once the water reaches boiling point (large, moving bubbles), add the macaroni. Stir immediately after adding the pasta, and occasionally during cooking process, to stop it sticking. Boil the macaroni for 7 minutes; you want it a little underdone as it will cook further when it goes into the oven with the sauce. 2) Peel the butternut squash and remove the seeds. Cut into quarters (you'll need about half a squash). Cut into slices, about as thick as a one pound coin (not too thick, as it'll take too long to cook). Boil for 7 minutes in lightly salted water. Melt the margarine/olive oil spread in a frying pan, sprinkle in the flour, and whisk. Let it cook for a minute. Slowly whisk in the chicken stock, then add the milk, and mustard powder. Turn up the heat, and bring to the boil. Let the sauce reduce until the consistency is like heavy cream (should take about 3 minutes). Whisk constantly. Once the squash is soft, drain it, and mash/blend until it's pureed, and lump-free. Addd this to the sauce, and stir well. 3) Pre-heat the oven to 180 degrees/gas mark 4. Grate the cheese over the large holes on a box grater. Stir the cheese into the sauce. 4) Drain the macaroni in a sieve; give it a good shake, and make sure to get all the water out. Then pour into the sauce. Stir well, and season with salt and pepper. Pour the mixture into a casserole dish (make sure to grease the dish before hand, with a little non-stick cooking spray). Pop the casserole in the pre-heated oven for 5 minutes............And then serve. A simple recipe for a childhood classic. I hope you enjoy, and this comes in useful. Please leave comments, feedback or messages. 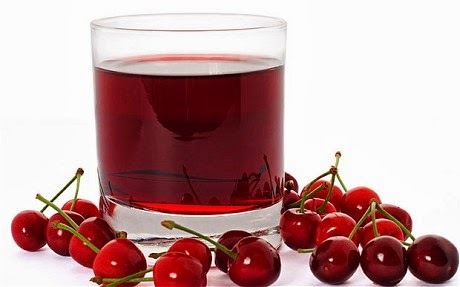 1) Scientific researchers have found that drinking cherry juice can improve all aspects of sleep in adults. According to the scientists, the key is the high melatonin content, which they believe causes optimum sleep-time. As well as this, eating cherries on a regular basis can prevent arthritis. They contain a high amount of anthocyonin, which is a compound that reduces inflammation in your joints and muscles. 2) There's 38% extra brain-boosting omega 3's in an organic chicken, compared to a caged chicken, so choose wisely when you're next out shopping. 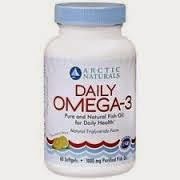 Omega 3's can also help prevent depression, arthritis and cancer, amongst other diseases. 3) Help protect your heart by eating honeydew melon. Top nutritionist Lorner Driver-Davies says that the fruits potassium and water content combine to combat the high sodium levels in a Western diet, which will safeguard your blood pressure. Another heart protecting food is the mushroom, which University of Illinois researchers found to be rich in total dietary fibres, that can help maintain a healthy heart. Still protecting the heart, the American Journal of Clinical Nutrition found that you could reduce your risk of a heart attack by 41% by taking a multivitamin everyday. 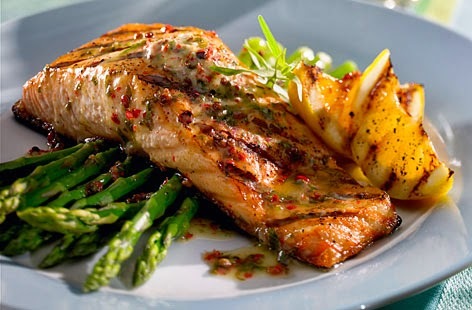 Healthy eating's the topic again as I give you a recipe of honey-mustard salmon with asparagus, a high-protein, low-carb meal, great for recovering from an evenings training session. Nearly 40g of protein, , virtually carb-free, over 50% of your RDA of folate and 40% of your RDA of vitamin C (both essential for muscle repair), and it's only 360 calories. Not only a great post-workout meal but also holds other essential health benefits in the ingredients. As mentioned in an early blog post, salmon can help reduce eye fatigue, which is ideal if you're sat in front of a computer screen all day. The asparagus can also keep your eyes healthy, as well as help fend of gum disease, lower blood pressure and fend off signs of ageing. 1) Heat the oven to 200 degrees/gas mark 6. Then combine the butter and brown sugar in a bowl, and microwave until the mix melts together. This should only take about 30-40 seconds. Remove and stir in the mustard, honey and soy sauce. 2) Toss the asparagus in a bowl with half the oil, and grate in the parmesan, and season to taste. Place the asparagus in a baking dish and roast until al dente. 3) Heat the remaining oil in a pan over a high heat. Season the salmon and add to the pan, flesh-side down. Cook for 3-4 minutes, until browned. Then you want to turn them over, and brush half the honey-mustard mix over the fillets, and place in the oven. Bake for around 5 minutes, until the salmon is firm, and flakes easily. 4) Remove from the oven, and brush them with the remainder of the honey-mustard mix. Plate them up with the asparagus and serve. And there you have it, a quick and simple healthy meal that can be cooked up in 20 minutes, enjoy! If you like this blog, please help maintain it by offering a small donation, of any amount, and ensure top quality content for the future. Donations are 100% secure through PayPal. The donate button is intended as a not-for-profit donation to help run the site and maintain top quality content for the future.